I just got back from Tanzania with the Farmer to Farmer program that promotes economic growth and Agricultural development in East Africa! I traveled to Tanzania for 2½ weeks to share my technical skills and expertise with local farmers. My assignment is part of Catholic Relief Services’ Farmer-to-Farmer (CRS FTF) program that promotes economic growth, food security, and agricultural development in East Africa. In addition to being a map printer, I am a smallholder farmer. I grow food for my family and am the chair of the Maryland Organic Food and Farming Association. This experience gave me the opportunity to stretch my limits. I have always found that I learn so much from teaching others. Plus, it is awesome to share the knowledge and experience that I have gained over the years, with a project promoting social justice. In Tanzania, I worked with Caritas Mbeya, training in organizational development, association strengthening, and giving technical assistance to smallholder farmers. 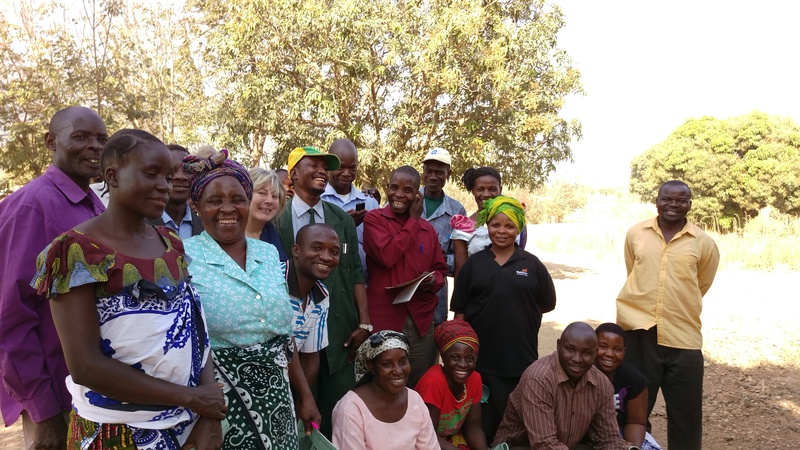 The objective is to enable smallholder farmer groups in Mbalizi Parish to improve leadership and management, enhanced group dynamics and cohesion, strengthen their associations and cooperation. 121 farmers attended the trainings, which will benefit up to 3000 villagers in the area. I taught the farmers in Mchewe, Itimba, and Muvwa Villages in Mbeya, Tanzania about contracts and contract farming. We analyzed the strengths, weaknesses, threats, and opportunities of their groups. Strong cooperative groups will help the farmers pool their resources to balance their power with the middlemen/buyers, and obtain contracts to sell a larger amount of product. The groups will be able to support members and save product to sell when scarce and prices are higher. We discussed, target markets and marketing mix. We talked about mission, objectives, what articles to include in their bylaws to strengthen and insure transparency and fairness. I even came up with “Holly’s 9 Leadership Tips”. “One thing we are certain of is that this program will be beneficial not just to the farmers in East Africa, but also to the volunteers from America,” said Bruce White, CRS’ director for the program. “It’s going to make the world a little bit smaller for everyone involved.” I agree! Funded by the U.S. Agency for International Development (USAID), the five-year program matches the technical assistance of U.S. farmers, agribusinesses, cooperatives, and universities to help farmers in developing countries improve agricultural productivity, access new markets, and increase their incomes. My volunteer assignment is one of nearly 500 assignments that focus on agriculture, food security and nutrition in Ethiopia, Tanzania, Kenya, and Uganda. This is the first time CRS has been involved in the 28-year-old Farmer-to-Farmer Program funded by the U.S. government. The U.S. volunteers travel to East Africa for anywhere from one to six weeks, their expenses covered by USAID. The view in Itimba Village, Mbeya, Tanzania. Handsome billy goat cleans up the cornfield in Mchewe, Mbeya, Tanzania. In Mchewe Village, Mbeya, Tanzania, they have Home Garden Group. They use organic methods to grow greens for their families and for market. Tomato plot in Mchewe Village, Mbeya, Tanzania. After learning more about contracts and contract farming, the farmers re more confident about using this tool for a guaranteed sale. Muvwa, Mbeya, Tanzania is in the highlands of southwest Tanzania. Farmers in Itimba Village, Mbeya Tanzania were very interested in learning about structures that would promote transparency and fairness. Beans grow well in Mchewe Village, Mbeya Tanzania. The groups have improved their farming methods and increased production 2 1/2 times. Now they grow enough to save and sell when the prices go up. A women’s group from Mchewe Village, Mbeya, Tanzania, displaying and selling their products at the Farm Show, Nane, Nane. Amarula, or elephant fruit. They made my mouth numb. Wine is made from them. The solar dryer in Itimba Village, is used by the women’s groups of Mshewe Village, Mbeya Tanzania to dry tomatoes, onions and beans. Chrysanthemum flowers contain pyrethrins. They are dried, powdered and used s an organic insecticide. The view in Mchewe Village, Mbeya, Tanzania. Zebu Cattle in Mchewe Village, Mbeya, Tanzania. Fish Ponds in Muvwa Village, Mbeya, Tanzania. Runoff from the ponds provides plenty of water for the bananas in the background. Chinese cabbage will be planted under the bananas.